On 17 December 2016, a bus-van collision led to the deaths of 11 Sinhalese travelling to Chavakachcheri, North Sri Lanka. The incident has become an excellent eyeopener ahead of the end of the year and before the beginning of a new year. It has showcased that the stereotype scenario media projects of people being disunited to be false. It has given momentum for hope and the need to remove all elements that are trying to divide the people. When the accident occurred in the heart of the North. the people who came running to the scene were not Sinhalese but Tamils. The victims were Sinhalese. The Tamils who arrived did not walk away because the victims were not Tamils. They did not walk away because the victims were Sinhalese. They did not shout hurrahs or clap because 11 Sinhalese had died. They all rallied together and did their best to take out the mortally wounded from inside the crushed van. The videos of the scenes will reveal the horrifying sight. The bodies of the dead were airlifted to Ratmalana for final burial in Kalutara. These Tamils did not stop there. The Tamils in the area did what media would never showcase and not many western diplomats or media would like to mention and not many politicians from all colors would also chose to highlight. These Tamils put up banners with teary eyes condoling the dead, they lit candles, placed flowers and offered prayers. It was a stark contrast to the Tamil academics and students who commemorated the LTTE dead inside the Jaffna university. The incident spelled out many messages all of which are valuable in the context of efforts to project the notion that people are divided. People are not divided. It is the politicians and others with vested interests who use media to project a wrong notion. We reiterate again that the majority and minorities live harmoniously however there are a handful of groups who are tasked and paid to cause disharmony and these groups are all tied to powerful sources either locally or external forces. The media also controlled by them are used to project a wrong notion and that in turn is fed into our minds for us to feel we are disunited when we are not. It takes a brave few like those who helped the victims and those who held candlelit vigils and made posters for us to wake up to reality and start questioning the wrong status quo. At this important juncture where politicians are telling us we are disunited and trying to divide the country so that they can continue to rule over us, it is now time for the People to rise against these divisive acts and tactics. The reaction and action of the Tamil people was a stark contrast to the Tamil politicians like Sambanthan, Sumanthiran, Senathirajah, Sivajilingam, Wigneswaran spewing venom and racism against the Sinhalese while living among the Sinhalese and being guarded by Sinhalese while LTTE prevailed. The manner they are using their caste and elitism to destroy people’s minds by filling them with hatred is unforgiveable. These old men have destroyed the good things that Tamils and Sinhalese have shared over the years. Tamil people are even scared to share an idli or dosa with the Sinhalese because they feel that they will be discarded from their community for doing so. Only a handful of brave Tamils have and are questioning this status quo. Some Tamils are now openly advocating against the Tamil caste and elite system that is dividing Tamils more than what is alleged against the Sinhalese. When Tamils do not entertain low castes even to give a cup of tea to a dying man because of his caste what is this discrimination by Sinhalese the Tamil politicians are ranting about! Ours is a small island nation. It belongs to all of us. No politician has any right to be dividing it or allocating land to people they are personally benefitting from. The world is in turmoil. All the parties that claim to have solutions have only aggravated the problem and they should not be allowed to do the same to Sri Lanka. Our problems are ours to solve. We do not need external players. We certainly need to tell the people we elect some of whom we have not elected that they have no business to be demanding the separation of our country, separating people on bogus and fictitious assumptions. We must all realize that we are living, working, eating, shopping, playing together as communities. Of course there are ups and downs but you don’t make constitutions each time there is an issue if so then families will have to make constitutions every single day! The Chavacachcheri accident is an eye opener to people not to allow politicians to harm our island nation by dividing us, dividing our small island and handing bits and pieces to other countries to turn Sri Lanka into a battleground for their geopolitical agendas. 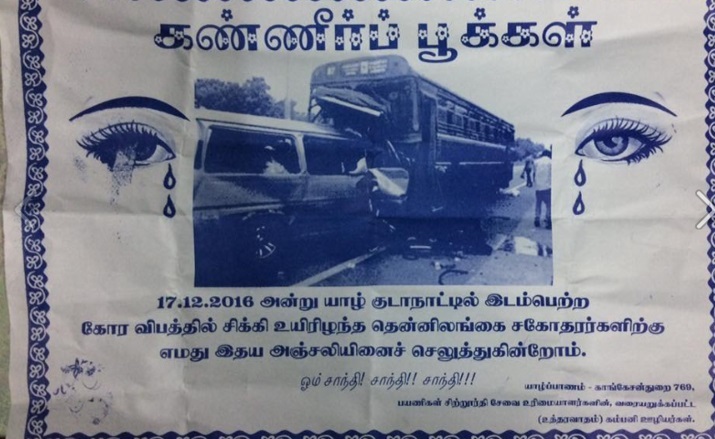 Translation – On the 17th December 2016 an accident occurred in Jaffna peninsula. Our tears and heartfelt condolences to the South SriLankan people who lost their life. Talk in Jaffna is this was NO ACCIDENT. It was deliberate to TEACH A LESSON to NAGADEEPA worshipping Singhalese. But there is a problem. Tamils are MORE VULNERABLE to these STAGED ACCIDENTS on them. Every day thousands of Tamils travel to and from Colombo THROUGH SINGHALA areas. What if there are retaliations? Tamils are DOOMED. To avoid this Tamils have put up these things FINANCED by a UNP MP in Jaffna. May the dead attain nibbana and may their loved ones find solace. Next time travel in LARGE BUSES to NAGADEEPA. robbery etc. etc. But the catholic-run media in Sri Lanka paint a rosy picture. or prospering as one family to better our lives. killed 100,000+ Sinhalese. Which fool going to think these racist bigots going to be ever happy with their kingdoms? Community who long for future bloodbaths with their separatist agenda. Ungrateful foreigners! Heartfelt sympathies to those families who lost their loved ones in this accident. Things for Yahap to do to correct the situation in Lanka. * Now, Enact the 6-A. INCLUDE FEDERALISM as SEPARATISM – a New Amendment should be introduced. About half of the Tamil folk of Lanka live among Others already. Continue to do so, with NO FEDERALISM. * Rehab the Sinhala & Muslim folk in the N&E – those who were chased out of the N&E by the LTTE should be allowed to go back and live in those areas if they want to do so, in safety and security. * REMOVE THE ILLEGAL 13-A, the most divisive piece of legislation in Lanka. * Tamil Leaders of Lanka ought to be told to stop fighting their Caste Wars tied to Cold Wars >> Separate State. An incident Sri Lanka should have sent to the World Media to convince that there is no hatred or perpetual animosity by Tamils on Sinhalese or vice versa, it’s only the divisive politicians who keeps projecting to the World that there’s no Harmony or trust among these two communities and they are at loggerheads eternally! The scenes that were captured by the CCT cameras near the accident (as this article says) site bears proof of the Tamils on the spur of the moment humanitarian actions they took irrespective of the ethnicity of the victims. These are the testing times of peoples emotions, they come from deep within the hearts of those who value and respect life of human beings, these feelings surface when there’s no politicians to poison the unpolluted minds! In the past When horrific atrocities were committed by the LTTE we did not give world wide publicity, however they captured our weakness and used the same pictures or video clips to give World wide publicity and got the sympathy from our sad predicaments! That’s why Sri Lanka has to defend themselves annually at the UNHRC hearings circus! “In the past When horrific atrocities were committed by the LTTE we did not give world wide publicity, however they captured our weakness and used the same pictures or video clips to give World wide publicity and got the sympathy from our sad predicaments! USA, Endia, EU, etc. KNOW VERY WELL about LTTE. That is why they BANNED it as a TERRORIST group. But when they see some USE of LTTE (or even AL QAEDA) they will get it!!! When they want to eat, KABARAKOYA —————-> THALAKOYA. When they don’t want others to eat, THALAKOYA —————–> KAPARAKOYA. e.g. AL QAEDA (darlings of USA when AQ was fighting SU). e.g. MUSHARAF – great friend when USA wanted to go to Afghanistan. AFTER getting his help he became a DICTATOR. e.g. MR was GREAT for USA until he got rid of LTTE. After that he became an enemy. IF you are a Buddhist you will NOT understand this OPPORTUNISTIC approach. unfortunate that LANKAWEB doesn’t see it !!! I DID NOT incite any violence. Please don’t MISINTERPRET what I write. This is a GENUINE FEAR the Jaffna Tamil society HAS. They see this DANGER unless peace and harmony is maintained. You have to be a Tamil traveling from the north to Colombo BY ROAD (not by air) to understand this fear. You correctly see the Katussa (Lorenzo)’s devious bomb throwing strategies to incite violence and setback the patriotic cause, but many readers don’t recognize it. This man preyrnds to support democratic vslurd and bemoans that others deny him free speech, but at the same time he advocates white vanning people, using weapons universally condemned like theobaric bombs, military take over in Sri Lanka! He speaks with a forked tongue from both sides if his mouth! A TRUE RATTLESNAKE! Always the purpose is to drive patriots into trouble by advocating extreme measures …. just like his late unlamented SunGod! I meant to write “theobaric bombs”! That was during the last phase of the EELAM war IV! කොළඹ මහජන පුස්තකාල ශ්රවනාගාරය ෆෙඩරල් සංහිඳියා නිරුවත සම්මන්ත්රණය. Din’t you all see this yet? FRIGHTENING! That talk summarizes very well the impact of the 6 COPE committee reports I had read in detail. The new Constitution proposed by the 6 COPE committees dominated by separatist Tamils and other minorities is DESIGNED to DESTROY Sri Lanka as a UNITARY nation, and to SUBJUGATE its Sinhala Buddhist majority. And the TRAITOR in Chief … Palwatte Gamaralage Maitripala Yapa Sirisena, aka Aiyoooo Sirisena, is presiding over the DISSOLUTION of Sri Lanka as we know it! 4. Allowing the TNA leader Sampanthan to be appointed as the Leader of the Opposition. Need I GO ON? TREACHERY MOST FOUL! ANOTHER PUPPET of the West, and an IMPLACABLE ENEMY of Sri Lanka, Ban Ki Moon’s TERM as UN Sec. Gen. ENDS! Yahoo! Another enemy of Sri Lanka is on his way OUT! The NEXT UN Chief will undoubtedly be YET ANOTHER PUPPET, but I hope he/she will a better disposed towards Sri Lanka than Ban KI Moon! Fri, Dec 23, 2016, 11:33 am SL Time, ColomboPage News Desk, Sri Lanka. Dec 23, Colombo: The outgoing Secretary General of the United Nations Ban Ki-moon has praised Sri Lanka’s commitment for reconciliation. The UN chief, whose term will end at the end of this month, has telephoned Sri Lankan President Maithripala Sirisena on Thursday, President’s Media Division said. He has commended the progress achieved in social, economic, political and all sectors in Sri Lanka, under the leadership of President Sirisena and said that Sri Lanka’s commitment for the reconciliation is praiseworthy. Mr. Ban expressed his appreciation over the great service rendered by the President towards taking Sri Lanka to a new path during his tenure as the U.N Secretary-General. He further said that under the leadership of the President, Sri Lanka would be able to achieve many victories in the future. Moon assured to provide every possible assistance to Sri Lanka for its future endeavors, even after stepping down from the position of U.N Secretary-General. President Sirisena also appreciated the continuous assistance given to Sri Lanka by the Secretary-General and extended his best wishes to Mr. Ban for his future endeavors.
. These Tamils put up banners with teary eyes condoling the dead, they lit candles, placed flowers and offered prayers.- Thanks & well done my Brothers(Tamil) put banner please put in sinhala as well . Sivajilingam , Suresh , MA Sumithran , Viyaja Kala and CM Viggie where are you ALL gone now ? why you all did not go to accident palce yet to put a flower (puu) ? sham on you all ? do you thing Sinhala people realy believe you ALL settler with United (Federal) Mother Lanka or Thani (separate) TE ???? Lorenzo may be telling the truth. There are no reliable eye witnesses to tell the tale. The police hasn’t come out with any investigation. What they have been told according to reports is that the driver was asleep on the wheel (at 1.30pm ?.). From what I read the van was going on the correct side of the road and the bus coming on wrong side. And when van came to other side to avoid the bus, it came to correct side and hit the van with such a force that all had to die. This perhaps is one of chain of events planned. Do not be modayas. Do not go in vans to Nagadipa again. Yes, some tamils may have expressed genuine sympathy as most are not wicked people. Shenali’s articles do not appear to be of her own. Perhaps she is writing for Indians. aloy, Lorenzo and Gonsul all in the in the same bandwagon…there may be more coming in. Charles, I understand what you say. But in a heavily built up area with CCTV and all that, will a bus travel at such a great speed to crush a van like that. Aloy Sinhala people are more generous and accepting. They will not attack the Tamils or Muslims with animosity. They are willing to live with them forgetting the past and burying the differences. The riots of 1958 and 83 were incited backlashes. Let us hope such a thing will not happen again despite the politicians like Wigneswaran, Sammpanthan and the rest. An accident can happen any where. Because it happzened in Jaffana let us not give it a different interpretation. The only riots in SL during my lifetime were the Dambula mosque burning riot in 2012, Aluthkama riot in 2014 and Grandpass riot in 2013. I OPPOSED all and DEMANDED culprits are arrested and punished but nothing happened. Muslim people were KILLED in the Aluthkama riot, mosques set on fire and Muslim shops were burnt. Only bandwagon I am in the the bandwagon of TRUTH, ready to collide with any other bandwagon and will not get hurt. TRUE, Sinhala people will not have animosity over something not proven. Only exception is against those who are in different bangwagons. I hope what Shenali says is TRUE and that the ordinary Tamil people of Sri Lanka harbor no animosity or hatred towards the Sinhalese. Let us hope that those feelings will turn into a willingness to act as common citizens of one country sharing a single vision. But, unfortunately, the facts speak otherwise. If what Shenali says is true, then how is it that the TNA and the ITAK sweep the elections in the North EVERYTIME? These parties are led by well known SEPARATISTS who worked hand-in-glove with the LTTE like Sampanthan, Sumanthiran and Sivajilingam and new RACISTS like Wigneswaran whose current policies are indistinguishable from those of Prabhakaran? Surely, the voting is SECRET and no one is compelling them to vote for these parties? If what Shenali says is true, why is the Tamil media and the intelligentsia are not saying so and shouting down the racist demagogues preaching division and hatred? I think the reason is quite simple: greed, racism and the STUPIDITY of the Sinhala Modayas. If the Sinhalese can be pushed into letting the Tamils have their own proto-EELAM cake and share in the rest of multi-ethnic multi-religious Sri Lanka as well, who on earth would not want a great deal like that? It is our SINHALA MODAYA mindset that encourages them to hold out for the most they can get. This new CONSTITUTION should be DEFEATED and this Yamapalanaya that tried to mount that ANTHATTUWA on Sinhala heads OUSTED immediately after that. 1. Sri Lanka will CONTINUE permanently as a UNITARY Sovereign state. 2. That no SUB-NATIONAL governments can EVER BE PERMITTED or CREATED in Sri Lanka. 3. That the 13th Amendment is REPEALED and Provincial Council System is DISSOLVED. 4. That a DISTRICT system of governance is instituted as an integral part of the Central National Government and administeted by a DISTRICT Governor and distribution t officials appointed by the National Government. 6. That the Executive Presidency will CONTINUE wihhout TERM LIMITS on the Presidency but subject to re-election through nationwide elections every 4 years. 7. That a new position of VICE-PRESIDENT is CREATED. The VP will be selected by the President as his running mate in the Presidential every 4 years and will provide continuity of leadership for the EXECUTIVE Branch if the President is incapacitated. The VP will preside also over the Senate. 8. That position of Prime Minister is ABOLISHED, and REPLACED Z by Majority and Minority leader positions. The position of speaker of the House shold be retained. 9. INTRODUCE a SENATE as the second chamber of Parliament with 2 Senators elected from each DISTRICT. All legislation must be ORIGINATED in the HOUSE OF COMMONS, and should be APPROVED by a majority in the Senate. The purpose of the Senate is to give a EQUAL measure of representation to each District whereas members are elected to the House of Commons from the Electoral Districts on the basis of equal representation for a given number of citizens. Therefore, more populous Districts will have more members of the House of Commons of the Parliament but each District will have only two Senators. 5. That BUDDHISM is the State Religion, going above and beyond the current Primacy accorded to Buddhism. Freedom of worship is guaranteed to all Sri Lankan citizens. ALL foreign missionaries of non-Buddhist faiths should be barred from proselytzing and converting people in Sri Lanka. 6. That SINHALA is the Only Official Language of Sri Lanka in which all government functions would be compulsorily carried out. Tamil and English should be declared to be compulsory LINK languages, but not OFFICIAL languages. 7. That ALL IMMIGRATION into Sri Lanka is banned and citizenship is not availsble for sale to foreigners at ANY PRICE. Dual-citizenship should be allowed for former Sri Lankan citizens on a case-by- as basis after examining their pro-Sri Lanka credentials. Only SOLE citizens of Sri Lanka should be allowed to hold the highest elected and appointed government positions in the land. If a dual-citizen wishes to hold such a position he/she must renounce citizenship of other countries. 8. That ALL LAND and REAL PROPERTY ownership by non-citizens is banned. However, foreigners should be able to LEASE/RENT land and other real estate for periods not exceeding specified category limits. 9. That ONLY ONE SYSTEM of law will be allowed to prevail in Sri Lanka. All community-specific laws, like Thesawalamai, Sharia and community marriage laws are declared ILLEGAL and NULL and VOID. 10. That only Marriage defined as between one man and one woman, is recognized. All other forms of marriage, including polygamy, popular in the decadent West and elsewhere should be declared illegal and not recognized under the law. 11. That TREASON is punidhsble by death. All laws sgdinst TREASON will be strengthened & enforced. Declare that collusion with foreign countries and organizations to change the ELECTED system of government in Sri Lanka is TREASON punishable by DEATH. 12. That political activity by foreign countries and NGO organizations, including those currently promoted by the embassies of various countries under the pretext of “democracy and good govetnance building” are BANNED and citizens do assist such activities are subject to prosecution under TREASON laws. How we do politics and governance e is our business, no body else’s. We don’t tell them how to live, we don’t want them to tell us how to live. 13. That the DEFENCE of the znation is every citizen’s respondibility znd duty. To that end, the condtitugion dhoild ptovide for STRENGTHENING the Armed Forces and their stationing throughout the country and along its borders. Also, military service should be made compulsory for all adults, male and female, between the ages of 18 and 60, and a combat-ready reserve militia should be created snd regulagly trained as backup to the full-time armed forces. 14. That the current Lion Flag and the National Anthem sung in the OFFICIAL Sinhala Language will remain unchanged. 16. That an important POLICY OF GOVERNANCE of the nation is to eliminate demographic concentrations within Sri Lanka that lead to communal divisions. To that end the government is required to use its resources to INTEGRATE & HOMOGENIZE the demographic distribution of people by creating incentives and programs for people to integrate socially in how and where they live, work and learn. No group or community will be allowed to become a barrier to National Integration. Such a NEW CONSTITUTION would DIRECTLY CONFRONT the Separatists, and other foreign and internal enemies of Sri Lanka. It would completely DEMOLISH the aspirations and plots of the EELAMISTS, and REMOVE the support that the Tamil Separatists get from ordinary Tamils for their RACIST SEPARATIST agenda, allowing ordinary Tamils to make peace and co-exist with the Sinhala majority. As long as the Sinhala Modayas allow the Tamil (and Muslims) to believe that they can get their own EXCLUSIVE communal-cake and share in the Sinhala cake too by their divide and rule politics, they will CONTINUE their DEMANDS and their AGITATION. The Yamapalanaya has created a PERFECT OPPORTUNITY with their drive to introduce a CONSTITUTION that DISMSNYLES and FEDERALIZES Sri Lanka, for the Sinhala people to DEFEAT IT, and use that MOMENTUM to CREATE A BETTER CONSTITUTION that will CONSOLIDATE the gains of the WAR-VICTORY of May 19, 2009! Let us SEIZE THE DAY, and make the EELAMISTS rue the day they tried to create a EELAM in Sri Lanka by CRAFTINESS in PEACETIME what they failed to GET by MURDEROUS WAR in WAR-TIME! Through his excessive GREED the late unlamented SunGod Velupillai Prabhskaran made the same mistake of misjudging the dedication of patient Sinhalese to their Motherland, that the Separatist Tamil Leaders are making now. Let us make them PAY FOR IT and LOSE IT ALL including the Provincial Councils! The ENTIRE Sinhala Nation is NOW SENSITIZED to the DANGERS & EXISTENTIAL THREAT to their motherland and their lives NOW. Where others ONLY see DISASTER, I see an OPPORTUNITY to create an enduring SOLUTION! Let us make this OPPORTUNITY COUNT! BTW, the Senate as proposed above is designed to give the Tamils and Muslims in the North and East a greater voice in governance through greater representation in the Senate thsn their numbers warrent, without giving them separatism-prone semi-independent Provincial Councils that hhey demand now. There are 25 districts in Sri Lanka, and 8 of them are in the Northern and Eastern Provinces and 17 districts are in the rest pf the country. That translates to 16 Senators (32%) from districts in the North and East compared to 34 Senators from the rest of the country, for x goral of 51 senahors including the VP who will preside over the Senate. If 32% is too high, and it seems to be, the representation from the North and East can be reduced by creating a few more Districts in other areas. We don’t need Districts , Gamsabhas or ANY kind of devolution, power sharing or any other rubbish. We are a small island which an easily be managed by 50 good human beings. We need legislation to make sure 50 such beings are given opportunity to run the country. At the moment we have 200 over AliBabas runining the country and endless number of Prohithayas residing overseas giving time wasting proposals. I have to agree with Ananda on this. Facts speak otherwise. Even people like Chelvanayagam, Amirthalingam, Sambandan and Vigneswaran are great humanitarians with good human values, I would not trust them for a second with Sri Lankan interests. Even the worst enemy of Sri Lanka can still be a great humanitarian. That is beside the point. The king that was kind even to animals was rejected by the people in favour of a prince who killed inside temples and disrespected his father. National interest comes ahead of humanity. Listen to some beautiful MGR+Jayalalitha song in Singhala. What is “National” interests ahead of humanity ? These “interests” will vary from individual to individual. The best example of such ambiguity is seen when one argues whethe rprevious govenrment worked for “National Interests” since the end of war. I am sure is this question is asked , there will be a near 50/50 division. will follow. It means we achive great “humanity” instantly. Picking up where Dilrook left off with his comment on his inability to trust Tamil politicians, I would like to add that the structure of the New Constitution for Sri Lanka I outlined above us is DRIVEN BY THIS INABILITY TO TRUST and DANGER INHERENT IN TRUSTING these proven potential separatists. Just like the victorious Allies of WWII who occupied Germany for many decades and still maintain NATO troops in Europe partly for that reason, we cannot thrust this ENEMY who murdered our citizens and threatened the integrity of our country, forgetting that it happened, that they nearly won, or the price we paid in blood, sweat, tears and lost opportunities while the rest of the world surpassed us. Accordingly, the main focus should be to give them and other communities equal rights wherever possible, but to DENY them opportunities to create a separate existence. Thus, we exclude all sub-national governmental structures, and FORCE then to participate on a national level, in the National government structure, if they want ANY VOICE IN GOVERNANCE at all. There will be no sub-national government power offered to Tamils, or to any other community. Foreigner powers, the Tamil Diaspora, and even the UN will come preaching diversity, human rights and democracy to us to advance their own geopolitical agendas, and even revive their threats of war crimes prosecutions. We must expect, and counter all those threats if we have to. As in the days of the MR/UPFA govt we will have to rely on non Western allies for support, and prepare to face economic embargoes froM the West. So be it; better that than the dissolution of our country and the destruction of our livelihoodsillegal and ultimate slavery to foreigners and unpatriotic minorities. Having said that, we must recognize that vast changes are taking place in the Western attitudes towards knee jerk human rights, democrazy export, trade globalisation, refugees and illegal immigration. Brexit and the election of Donald Trump are indications of this move to bring sanity to these self-destructive Western ideas of the recent past. Next year, Italy, France, Netherlands and several other countries have elections scheduled to decide on whether or not to remain in the EU and conform to its globalist agenda set in Brussels. Angela Merkel has rolled back her support for illegal and legal refugee immigration, and is reviewing their security policies in the wake of attacks by ISIS. US and NATO policies have suffered a serious setback in the Middle East, and the sanctions against Russia for the annexation of Cromer and the support for Ukrainian dissidents is waning even as Donald Trump moves towards establishing a new cooperative policy towards Russia. All of these may mean that the HYPOCRITICAL DOUBLE STANDARDS used by the West against Sri Lanka, the only functoning democracy to have confronted and defeated a terrorist insurgency since the Malaysian Communist insurgency, may be relaxed. Sri Lanka may get a more sympathetic hearing as the West grapples with the same international terrorism, human trafficking and exploration of engineered refugee movements that we faced. There is nothing close to being gored by the sane bull to excite empathy from your worst detractors! Till the day the divisive and ILLEGAL 13-A is removed and till the Vadukoddai Resolution (1976) is Revoked officially in Parliament, there will be NO real Peace in Lanka. We hold ALL leaders of Sri Lanka responsible to remove these items OFFICIALLY. Very insightful and structured comments by Ananda and Gonsal. We lack this type of structured thinking in Sri Lanka – in politics, among political commentators, journalists and other opinion leaders. The way to marry national interest and humanity has been beautifully summed up by Gonsal. Unfortunately this is not the case since 1977. A super class has been born since 1977 with money earned through corruption and crime. This money funds politicians, NGOs, media institutions, other crime syndicates and entire dynasties. To survive in such a society, even average people are taking up deceit, crime and foul means to get ahead. Next generation of Tamil and Muslim “moderates” living outside the north and east will argue that they want to break free from this corrupt, criminal and deceitful political system by having their own autonomous units. Even some Sinhalese will support it as they too will be fed up of this system. Massive foreign debt, corruption, lack of relevant and equitable development and hopelessness will drive Sinhalas to become indifferent to division of the country. I have read some commentators saying they don’t care about corruption as long as national security is maintained. It becomes a shortsighted approach in a democracy. It works in a dictatorship. Now this man Gonsul proposes instant humanity, like instant noodles !!! I agree with most of what Shenali says. Vast majority of Sinhalese and Tamils are not racists and they treat each other like brothers and sisters. When they interact they do not even feel they are from different communities. However, there are criminals who commit crimes against other communities as well as within their on community. These are the ones that need to be disciplined. Some people think these accidents are genuine accidents and some think they have been staged to prevent Sinhalese travelling within their own homeland in the Northern and Eastern regions. In fact some think, the decision by some Eastern Province Hotels not to rent rooms to Sri Lankans could really be a cunning way to reduce the presence of Sinhalese in the North and East and thereby gradually alienating the two communities, by reducing interaction. Sometimes they do it openly, such as the events in Universities where they assault and scare off Sinhala students, and other measures like opposition to Sinhalese returning to their own lands from which they were evicted over the past several decades. All these events are moving in one direction and that is to sideline non-racist Tamils and leave administrative matters to separatist minded politicians. Government needs to be vigilant and identify these manures by racist separatist elements and take strong and bold measures such as removing from important administrative positions, people like Vigneswaran who keeps making offensive remarks and false allegations and try hard to prevent Sinhalese their birth right to live in any part within their own homeland from North to South and East to West, which right has been enjoyed by Tamils and Muslims even at the height of LTTE terrorism. sorry for the typo in my previous comments incorrectly spelling the word ‘manoeuvre’ as ‘manure’. Muthuswamy Mohanraaj- well done , are We all gone back to 80 ish golden time . MS Fenando ( Sinna mamiye … ), AE Manoharan (Ilankai emathu thai thirunadu…), Nigal ,many more …..
GoSL should not pretend to be able to solve the Tamil CASTE problems created in Tamil Nadu. The main and real Tamil Problem is the CASTE problem as Caste is stated in their birth certificates in Tamil Nadu, INDIA. INDIA also conducts the Census on a CASTE base. All other problems of the Tamils of Lanka are common to the Others living in Lanka. GoSL should address these common problems in a rational and sane manner instead of, again, pretending that their proposed New Constitution which virtually divides Lanka into mini states by giving undue powers to the Provinces, will solve the so called “Tamil problem”. Foreign powers that want to gain from such divisions are the winners, not the People of Lanka. Lanka may be going backwards to some type of neo-colonisation with Yahap govt blunders. Fran is correct on this one. Tamil Hindu caste system is at the heart of the problem. Now this is taking centre stage in Tamil Nadu politics since the death of Jayalaitha. The two low castes Dalits and Gounders (Vellalar in Sri Lanka) are the backbone of AIADMK making up most of its voters and 60% of elected MLAs. Now Gounders (Vellalar in Sri Lanka) are demanding more power. Their main grudge is against the Mukkalathor caste which includes the new chief minister. This Gounder (Vellalar in Sri Lanka) strife is played out in Sri Lanka as well. It will worsen as Tamil Nadu caste disputes heat up. You have NOT UNDERSTOOD what I proposed. The District System I proposed is for administration of the country by the Central National Government, not for parcelling out power to local residents. ALL officers of the District administration are APPOINTED by the government and are National Government employees. Because they are NOT ELECTED by the people of those Districts, there is NO DEVOLUTION OF POWER TO ANYONE by the national government, and the proposed system is not an ADDITIONAL level of LOCAL GOVERNMENT. Also, your previous comment on “humanity” as opposed to “National Interest” is meaningless and not germane to the primary issue I was addressing. I was addressing the problem of how to devise a system of Government that does not pander to or promote separatism. You dragged in “humanity” as if what I was proposing was in some way “inhume” as a catchall complaint that has no relevance whatever to the issue. Only EELAMISTS and other separatists who have an axe to grind would make those kind of comments, as Charles correctly noted in his criticism if your humanity comment. I have often said that this kind of comment is TYPICAL of EELAMISTS who pose as wailing victims whose “humanity” is under attack to gain sympathy and hide their own vicious transgressions on humanity. Even as they bombed people to bits in trains, buses and buildings, sliced and diced hundreds of villagers in the dead of the night, brainwashed children into cyanide pill carrying brainless suicide bombers who killed without pity, ethnically cleansed the North and East of all non-Tamils, hunted down and killed Buddhist Priests, attacked places of religios worship, murdered in coldblood thousands of captured soldiers and policemen, orchestrated the exodus of Tamils into Western countries to exploit their wellfare systems to generate money to fund their terrorism, and on and on ad infinitum, ad nauseam. That is record of inhumanity without parallel that they created while wailing as victims of Sinhala discrimination! Your knee jerk reaction and strategy mimics that of those MURDEROUS EELAMIST HYPOCRITES, confirmING AGAIN that you are another EELAMIST working in collusion with that other EELAMIST SOB Katussa (Lorenzo). Why don’t you and your SunGod Katussa (Lorenzo) BUGGER OFF? We know who and what you are! Be a good little Kalawedda and do it quick! යාපනය නුවර ඒ නවය මාර්ගයේ වවුනියාව ඉරට්ටපෙරියකුලම භූ ඔය පාලම ආසන්නයේදී අද (27) උදෑසන කැබ්රථයක් කන්ටේනර් රථයක ගැටී වෛද්‍යවරියක ඇතුළු පුද්ගලයින් තිදෙනකු මියගොස් තවත් එක් පුද්ගලයකු තුවාල ලබා රෝහල් ගතකොට ඇතැයි මැදවච්චිය ‍පොලීසිය කියයි. මෙලෙස මියගොස් ඇත්තේ එම්.ඩී. අයෝමි සුදේශිකා නමැති 32 හැවිරිදි වෛද්‍යවරියක හා ඇගේ ස්වාමිපුරුෂයාගේ පියාවන මොහොමඩ් සබ්‍රි (58) සහ මොහොමඩ් මරීනා (52) නමැති අ‍පෝන්සුපාර දෙහිවල කොළඹ පදිංචි පිරිසක් වෙති. අනතුර සිදුවන අවස්ථාවේ මෝටර් රථය පැදවූ මොහොමඩ් සබ්‍රි සාරු නමැති 32 හැවිරිදි ඉංජිනේරුවරයා අසාධ්‍ය තත්ත්වයෙන් වවුනියාව මහ රෝහ‍ලේ දැඩි සත්කාරක ඒකකයේ ප්‍රතිකාර ලබන බවත් ඔහුගේ තත්ත්වය බරපතළ බවත් රෝහල් ආරංචි මාර්ග සඳහන් කරයි. කොළඹ දෙහිවල සිට යාපනය බලා ධාවනය වූ කැබ්රථය යාපනය සිට පැමිණි කන්ටේනර් රථයක ගැටී මෙම අනතුර සිදුව ඇතැයි ද ‍පොලීසිය පවසයි. අනතුරින් පසු කැබ්රථයට දැඩි හානි සිදුවී තිබූ අතර ‍පොලීසිය පැවැසුවේ මියගිය වෛද්‍යවරියගේ සිරුර පිටතට ගැනීම සඳහා විශාල වෙහෙසක් දැරීමට සිදුවූ බවත් සෙසු පුද්ගලයින් කඩිනමින් වවුනියාව රෝහල වෙත යැවූ බවත්ය. මැදවච්චිය ‍පොලීසිය පැවැසූවේ කැබ්රථයේ රියදුරුගේ නොසැලිකිලිමත් රිය ධාවනය හේතුවෙන් මෙම අනතුර සිදුව ඇති බවට සැක පළකරන බවයි. කන්ටේනර් රථයේ රියැදුරු අනතුර සම්බන්ධයෙන් අත්අඩංගුවට ගත් බවත් ඔහු අද (27) අනුරාධපුර මහෙස්ත්‍රාත් අධිකරණය වෙත ඉදිරිපත් කළ බවත් ‍පොලීසිය පැවැසීය. මියගිය පුද්ගලයින්ගේ සිරුර සම්බන්ධයෙන් පශ්චාත් මරණ පරීක්ෂණය වවුනියාව මහරෝහ‍ලේ සිදුකිරීමට නියමිතව තිබුණි. සිද්ධිය සම්බන්ධයෙන් මැදවච්චිය ‍පොලීසිය වැඩිදුර විමර්ශන සිදු කරති.